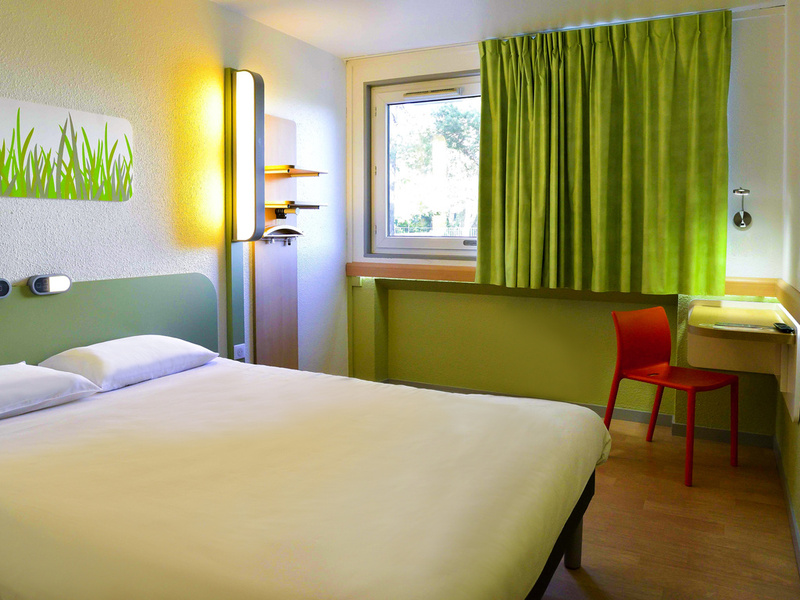 At the northern entrance to Bordeaux, the ibis budget Bordeaux-Lac, formerly an Etap Hotel, is your economy hotel of choice, located just 3.1 miles (5 km) from the city center and on the edge of the Médoc region, 45 min from Saint-Emilion, Arcachon and the ocean. The conference center is 219 yards (200 m) away. Enjoy the benefits of a delicious breakfast at a great price, free WIFI, and a comfortable and modern room! The Triple Room with a large bed and an overheard bunk can accommodate up to 3 people, and includes a shower and toilet, flat-screen TV and WIFI. The Twin Room with twin beds or the Double Room with a large bed can accommodate 2 people, and include a shower and toilet, flat-screen TV and WIFI. The room was difficult to warm up. We think it may have been used by dog owners. Also we woke to see ants in the room. We got what we paid for .. The ratio price/quality is fairly good. Decent size room. Good decor. Perfect location. Miserable receptionist. The hotel room was a little bit out of touch ( colour and cleaning wise) but the staff were brilliant!!! Excellent customer service to all the staffs at the reception. Gave good advice on place to eat and tour citing. I would definitely come back again! Clean, friendly, secure and convenient. Easy check in. Car park behind locked gates with a key code was great. Room was clean and adequate. Public areas neat and tidy. Satisfied with the stay, clean room, friendly staff. Room was a bit too humid though (almost damp blankets and bed sheets). The staff were extremely helpful when the Accor Hotel website came up with the wrong date for our next evening at Ibis Budget Rennes. As a result, when we arrived the staff in Rennes helped us with our check in and made our stay in Rennes as good as our stay in Bordeaux. We always choose Ibis Budget when travelling in France. Walls were thin and other guests noisy. Clean, quiet and very handy for the tram. The hotel was excellent value for money, clean and comfortable bed and adequate breakfast. Very easy to find and direct access to the tram into the centre of Bordeaux. Did what is said on the can! One night only - Good - early start in morning. Evening meal in Ibis hotel with 15% discount - surprised that waiter was not allowed to take the 15% when offered as tip. Excellent experience. We stayed with you last year on route to Spain. Like last year, we found the hotel staff very friendly and helpful. Excellent breakfast to set us up for a day of exploring.